Personally, I love �samplers� � they give you a chance to listen to a lot of different artists and get an idea of their style etc., before you decide on buying their CD. The Future of the Blues, Vol. 3, from Canadian label NorthernBlues, is no exception � unless you count the fact that it will probably persuade you to buy CDs by most of the artists featured, if you don�t already have them! In the US it comes out at $7.98, which is unbelievably good value for a CD of really excellent blues. Some of the songs on the CD are from albums already reviewed in Blues Bytes, so you only have to go to the previous reviews to find out what they�re like � others are new and maybe haven�t been reviewed yet. Watermelon Slim has three tracks on the CD, and all of them are up to his usual high standard � one, "Blue Freightliner," is a track that was recorded for the album No Paid Holidays but didn�t make it onto the CD, so there�s a bonus for his fans! I�d love to know why the track wasn�t included on No Paid Holidays because I think it�s a great one. I�ve reviewed the recent CD�s by Homemade Jamz Blues band, Moreland & Arbuckle, Samuel James and Carlos del Junco, and there are tracks on this CD from all of them, and all of them are good picks � whoever put this sampler together knows his (or her) stuff. This CD has so many styles of blues that it�s difficult to classify, but it is very good value (as I said above) and it gives a good insight into what NorthernBlues is about and how good their stable of blues stars is � Watermelon Slim, Mem Shannon, Homemade Jamz Blues Band, Moreland & Arbuckle, Samuel James, Eddie Turner, the list just goes on � this CD has 15 excellent blues tracks. Cuban-born, Canada-based Carlos del Junco is one of the foremost harmonica players of the moment, having won the Maple Blues Award for harmonica player of the year FOUR TIMES! In addition, he has won two gold medals at the Hohner Harmonica Championships in Germany, which all goes to prove that he knows his stuff when it comes to playing the harp. Steady Movin' is his eighth CD since 1995, and his second on the NorthernBlues label, so he�s obviously a productive musician. His last CD, Blues Mongrel (also on Northern Blues) deservedly received good reviews, and I personally think it was a bit better than his latest release. That�s not to say that this is a bad CD by any means, but the previous one was certainly more to my taste, and a bit bluesier. There are definitely tracks on this CD that should be listened to, and that really give the listener a good idea of what this guy can do � try the opening track �Diddle It� or �Bailey�s Bounce� to see what he�s about. EDITOR'S NOTE: Another review of this CD follows later on this page. I�m a huge fan of Dorothy Ellis � aka Miss Blues � songwriter, singer and author, and this album, Bad Prospects, is, to my mind, her best yet. Miss Blues had been gigging for somewhere in the region of 60 years before she released her first recording, and it�s just a pity that she waited so long � why didn�t she start recording 40 or 50 years ago?? 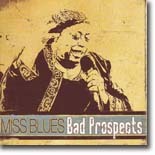 This latest CD, Bad Prospects, comprises nine tracks in total, seven of which are written by Miss Blues � one of the others is written by Chris Henson, who plays guitar on the track, and the other by Don Skinner, who contributes the bass playing and some of the vocals. Henson and Skinner also appear on most of the other tracks on guitar and bass. All of the musicians featured here are top class. As well as Henson and Skinner the others are worthy of mention too � Rob Hibbard, Mark Lyon, Ron Harmon, Joe Skinner, Mike Hardwick, T.Z. Wright, Robert Riggs, Frank Zona and Jim Johnson. The album opens with the Miss Blues original, �Blood Running Cold,� a song about a relationship going wrong (as in most of the best blues songs down through the years) � the song is full of expression and emotion, and if you didn�t know before, then you know now that this woman has lived the blues. �Billie�s Blues� follows up --- a slow, moody, atmospheric, number so representative of this woman�s talents. Track three is the title track of the album, a number about poverty and the struggle to stay afloat in life, and then the tempo picks up with track four, �Rub Board Boogie� � and I have to say that Miss Blues is a rub board maestro! Joe Skinner comes to the fore on the organ here and I really wish that the track was far longer than it�s one minute and forty nine seconds. �Trapped� is the fifth Dorothy Ellis penned track � and it�s at least as good as the previous four, if not better. This is the blues at it�s best � not reliant on cover versions, but using the familiar themes of love and relationships as people have done since the blues started. The only instrumental comes up next, �Midnight City�, written by Chris Henson � smoky, jazzy, bluesy and good. Saxophone from Frank Zona adds to the flavour of the piano and organ supplied by T.Z.Wright and Chris Henson�s guitar above the rhythm section of Don and Joe Skinner. Miss Blues resurrects a couple of numbers from earlier CDs � �Sinking, Sinking, Sinking� and �Cold Mountains,� and gives both of them a slightly different feel, and Don Skinner adds �It�s Gonna Rain� where he and Dorothy share the vocals to very good effect � this track has a compulsive driving beat to it, with Ron Harmon on the organ and Chris Henson laying down some more good guitar. Bad Prospects is one CD that every lover of the blues should have a listen to. Liz Mandeville recently released her fourth CD for Earwig, Red Top. Mandeville (who formerly performed as Liz Mandville Greeson) has put in two decades of touring in the U.S. and Canada, as well as branching out into the European countries in recent years, and has dazzled all comers with her sassy songwriting and smooth vocals. Red Top may be her best effort yet. Recorded in two different sessions, Red Top features an impressive group of Chicago-area musicians, including keyboard player Allen Batts, drummer Twist Turner, and former Magic Slim guitarist Michael Dotson (who lays down some sinewy fretwork on �My Baby�s Her Baby Too�). Sax legend Eddie Shaw also drops by for a couple of tracks, including the rowdy �Guilty or Rockin� All Night.� Mandeville also employs a full horn section on several tracks and even features a gospel choir (The Black Roses Gospel Choir) on one track. Adept in blues and swing, Mandeville gracefully blends the two genres together. The swinging title track opens the disc and sets the bar pretty high. Fortunately, Mandeville reaches and exceeds it several times. �Corner Bar Blues� is a groovy Chicago shuffle, which is followed by �Dog No More,� which packs a powerful groove thanks to bass player Andre Howard, drummer Janet Cramer, and guitarist Luke Pytel. �Scratch the Kitty� is the best of several salacious tracks and is one of three tracks where Mandeville plays lead guitar. �Bad Man Blues� is a swinging R&B track and features Mark Wydra on guitar, while �Hold Me,� the first track that features Shaw, is a deep soul ballad. The closer, the Chuck Berry-esque �Little Queen,� closes the disc on a high note. 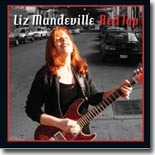 Red Top is a great addition to Liz Mandeville�s catalog, with plenty to offer fans of high-energy blues and swing. 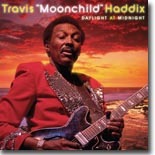 Since the late 1980�s, Travis �Moonchild� Haddix, the pride of Hatchie Bottom, Mississippi, has released album after album featuring his own special brand of hot urban blues mixed with contemporary soul. In addition, he�s penned several classic tunes recorded by other blues artists like Michael Burks, Son Seals, Jimmy Dawkins, Lee �Shot� Williams, Charles Wilson, and Artie �Blues Boy� White. Haddix�s most recent output, from his own WannSonn label, has been hampered by distribution problems, so he�s had problems being heard by a wide audience (though he is popular in Europe), but his latest release from earlier this year, Daylight At Midnight, has been picked up by Chicago�s Earwig Records, as well as his previous WannSonn output. Haddix has been around the blues all his life. His father, Chalmus �Rooster� Haddix, was a Delta bluesman who played piano, fiddle, harmonica, and guitar at Saturday night fish fries, and when he was eight years old, his brother Hal took him to see B. B. King. Seeing King (and hearing him play every day on WDIA out of Memphis) inspired Haddix to learn to play the guitar. Over the years, he played with several bands in the Cleveland area, including Chuck & the Tremblers and Ernest & the El Roccos, where he earned his �Moonchild� moniker from the title of one of their singles. Daylight At Midnight will not disappoint his fans, who have become accustomed to his clever songwriting, B. B.-inspired guitar work and his gritty soul-drenched vocals. On �Backward Baby,� Haddix admits he�s lived the blues so long that the only time he�s truly happy is when he�s sad. �Who Could I Be� is a classic soul ballad with a twist�.the only person Haddix wants to be is who he is already, because of his lady�s love. �Way Back Into the Country� is an autobiographical song full of wit and wisdom and �Good Buddy Blues� tackles a familiar blues theme, the good buddy who hits on his best friend�s gal. Haddix wrote the title tune describing a town he played several years ago in northern Finland. Haddix is at the top of his game on this release. Vocally, he�s never sounded better and his guitar work is as consistently fine as ever. He enjoys superlative backing from members of his Cleveland band, including Greg Nicholson (bass), Gil Zachery (keyboards), Jeremy Sullivan (drums), and a fantastic horn section (led by trumpet player Jeff Hager and featuring David Ruffin on tenor sax, Gus Hawkins on alto sax, and T. J. Fortunado on baritone sax). Additional musicians include Ray Deforest (bass), Mike Calhoun (lead guitar), Bob Frank (lead guitar and harmonica), and Robert �Red Top� Young (Hammond B3). As stated above, Daylight At Midnight will please Travis �Moonchild� Haddix�s longtime fans, but thanks to Earwig, he now has the opportunity to reach a wider audience that will surely appreciate what he has to offer. Chris James and Patrick Rynn are probably best known as the leaders of their group, the Blue Four, and for their work with artists like Sam Lay, Dennis Binder, Jody Williams, Dave Myers, Bob Corritore, and Rob Stone. The pair has branched out on their own (is it possible for a duo to go solo?) and have released a new disc on the Earwig label, Stop And Think About It, which is a superb mix of classic covers and faithful original tunes. James is a first-rate singer and his guitar work pays tribute to those classic performers of the �50s and �60s while mixing in a few modern flourishes here and there. Rynn anchors the band on bass and also co-authored the five original tracks, which blend effortlessly with the covers. The highlights include �Mister Coffee,� a fresh take on an old blues subject, the rousing �You�re Gone,� the slow groover, �I�d Like To Write A Letter,� and the title cut, which sounds like an old-time Chicago shuffle. James and Rynn are backed by a stellar group, including Corritore, Stone, David Maxwell, and Lay on a few tracks. Fellow Blue Four member Willie Hayes adds drums to one track. 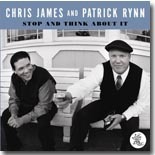 Stop And Think About It features plenty of good, solid blues just like it was played in the Windy City years ago. These guys learned their lessons well and here�s hoping there will be plenty more to come from them. Tulsa native Scott Ellison grew up during the city�s emergence as a blues/rock hotbed. In the �70s Tulsa was home to Eric Clapton�s and Freddie King�s bands, as well as home to Leon Russell�s Shelter Records, which was King�s label in his later years. Ellison was heavily influenced by the British Invasion bands, the Motown sound, and the Memphis soul music of the time. In the late �70s, he toured as a guitar player with Jesseca James (Conway Twitty�s daughter), and subsequently joined �Gatemouth� Brown�s band as rhythm guitarist in 1981. Since the �90s, Ellison has led his own band and opened for countless acts, including B. B. King, Buddy Guy, Joe Cocker, Roy Orbison, Leon Russell, Bobby Bland, and the Fabulous Thunderbirds. Ice Storm is Ellison�s sixth release and his first for Earwig Records and it consists largely of performances from his earliest releases, most of which have been hard to find in recent years. The performances range from 1997 to 2007, but there�s not much difference in the quality or intensity of them. Ellison is a powerhouse guitarist and a strong vocalist and he wrote or co-wrote all 12 tunes here and they are fine examples of blues/rock. �Steamin�� kicks off the disc on a high note, and �Big Blue Car� is one of four tracks that feature horns. The best of the tracks with horns has to be the title cut, a swinging instrumental that ends way too soon. �King of the Blues� is a another solid rocker driven by Tom Canning�s groovy B-3, while �I�m In Trouble� is more of a straight slow blues number with some impressive guitar and one of the best vocal turns on the disc. �Cadillac Woman� is another straight blues, this time a shuffle featuring a searing guitar break. Ice Storm is a sturdy, well-crafted set of blues/rock. 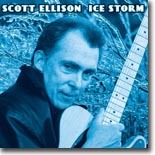 With his guitar chops to go along with his songwriting and vocal talents, Scott Ellison shows himself to be among the cream of the crop in the blues/rock genre, and by reaching back into his catalog, Ice Storm shows that he�s been there for a while. Born in Cuba and raised in Canada, Carlos del Junco is one of the outstanding harmonica players in the world. While he is comfortable playing the blues, his style envelopes many different genres, including jazz, country, funk, and roots rock. He plays a ten-hole diatonic harmonica using the recently developed �overblow� technique, which gives him a more expressive tone. All of this technical talk may not mean a lot to some of you, but listening to del Junco�s latest release, Steady Movin� (NorthernBlues Music) will tell you all you really need to know��this cat can blow some serious harp!! The opener, �Diddle It,� is an enticing funk workout featuring del Junco, Kevin Breit (Norah Jones) on guitar, and bass player Marc Rogers. �Dull Blade� plays like a spy movie theme, with Denis Keldie�s keyboards bubbling in the background, while �Jersey Bounce� is a loose jazzy piece, with del Junco taking a relaxed approach. �Mashed Potatoes Canada� is a light-hearted Canadian tribute to James Brown, featuring veteran blues singer John Dickie on vocals and del Junco pays loving tribute to the legendary Sonny Boy Williamson (Rice Miller) on the dazzling �Movin� Down The River Rhine,� which also features a playful vocal turn. The breezy �Paradise� has a country feel to it. �Amazing Grace� is a solo track that really shows del Junco�s virtuosity on the diatonic harp. �Bailey�s Bounce� is another tribute, this time to one of the pioneers of the harmonica, Deford Bailey. The album closes with �Doodle It,� a jaunty reprise of the opening cut. Speaking of pioneers, Carlos del Junco is taking the harmonica in astonishing directions. Though the harmonica has long been underappreciated in most musical genres (excepting blues), del Junco promised to change all that and gets closer to doing so with each release. Steady Movin� should remove all doubt that he is one of the finest harmonica players ever. 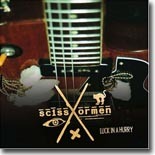 Scissormen consists of slide guitar wizard Ted Drozdowski and drummer R. L. Hulsman. Based in Nashville, this duo has taken the Mississippi Hill Country sound to a whole new level over the past few years, with a couple of CDs and their mind-blowing live shows to help spread the word. Guitarist Drozdowski counts as his mentors a diverse group of musicians including R. L. Burnside, Jessie Mae Hemphill, Junior Kimbrough, and Sonny Sharrock. Their latest release for VizzTone, Luck In A Hurry, is their first disc to be distributed internationally, and listeners will find that although Hill Country blues is at the heart of Scissormen�s sound, Drozdowski�s searing slide guitar adds another dynamic to the genre. In addition, they�re not afraid to add a few other flourishes as well. The opening track, �Tupelo,� kicks off with, of all things, a xylophone intro, before Drozdowski�s blazing slide and plaintive, desperate vocal leaps to the forefront. �Mattie Sweet Mattie� adds fiddle and piano to the mix, and Drozdowski�s slide knocks their cover of Son House�s �Death Letter� out of the park. �Junior�s Blues� is a tribute to Kimbrough with more fiddle provided by Dan Kellar. The blistering �Whiskey and Mary Jane� features Mighty Mighty Bosstones leader Dicky Barrett on vocals. The focus on the final four tracks is on Drozdowski�s incredible slide work, as he�s accompanied only by Hulsman or Larry Dersch on drums. On tracks like �The Devil Is Laughing� and �When The Devil Calls,� it�s almost like his guitar takes on a life of it�s own, or is at least channeling the songs� topic, while on �John The Revelator,� Drozdowski incorporates a far-out �Bo Diddley on Mars� beat. Drozdowski�s vocal style reminds me of a mixture of Bob Dylan and Mason Ruffner, understated but still charged with emotion. Luck In A Hurry propels the raw, ethereal sounds of Mississippi Hill Country blues into the 21st Century with Scissormen�s take-no-prisoners approach. Simply put, if you�re a Hill Country blues or slide guitar fan, this disc will blow your doors off their hinges. Lluis Coloma is a fixture on the European blues scene. He started out playing classical piano, but soon fell under the spell of Jerry Lee Lewis, Roosevelt Sykes, and British keyboardist Alan Price. He taught himself rock & roll, blues and boogie woogie. Currently, he serves as artistic director of the Barcelona Blues Festival. Boogie Portraits (Swing Alley) is his fourth release and features Coloma in a series of duets with some other prominent blues and boogie piano legends, including Mitch Woods, Carl Sonny Leyland, Barrelhouse Chuck, Frank Muschalle, Bob Seeley, and Mark �Mr. B� Braun. The sound is magnificent, with Coloma�s piano coming out on the left channel and the guest piano player on the right All the duets were recorded at the Nova Jazz Cava Terrassa and Centre Cultural Barradas L�Hospitalet between September, 2007 and January, 2008. 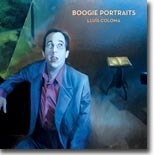 For fans of blues and boogie woogie piano, Boogie Portraits should earn a permanent spot in your collection. For more on Lluis Coloma, check out his website (www.lluiscoloma.com) or search for him on YouTube. 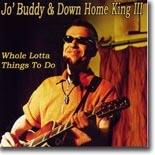 Jo� Buddy & Down Home King III are a duo from Finland, who specialize in a unique musical blend of blues, ragtime, zydeco, ska, country, rockabilly, garage rock, and soul. Their music is hypnotic and raw, but has a laidback quality to it, with a touch of New Orleans mixed in. Jo� Buddy is actually singer/guitarist/songwriter Jussi Raulamo, who�s 25+ years of performing has included over 2000 shows in Europe and Northern America and has opened for or played with just about anybody who�s anybody in the blues world. Down Home King III is his 20-something partner, who provides drums and percussion. Listening to the duo�s second release, Whole Lotta Things To Do (Ram-Bam Records) is probably the best way to understand what makes them tick. Believe it or not, they manage to squeeze elements of all the above listed styles into most of these songs. Jo� Buddy has a nice soulful voice and is a first-rate guitarist. He plays guitar through an old tube radio amp, which gives his guitar an outer-spacey sound on some tracks. Down Home King III�s percussion work is right on time and provides a great backdrop to these tracks. Highlights include �Howlin� These Blues,� �Have Yourself A Ball,� which owes more than a passing nod to Jimmy Reed, �They Don�t Know What I Do,� Mississippi Delta blues via Scandinavia, and �Thank You Mr. Lockwood Jr.,� a shuffle in tribute to Robert Jr. Lockwood. As stated above, this music is raw and hypnotic and probably different from most blues you�ve heard before. Combining all of this into one cohesive unit could have been a disaster in the wrong hands, but fortunately, the duo is able to pull it off effectively, making Whole Lotta Things To Do a successful endeavor. For those of you who�ve never been to Memphis for the International Blues Challenge, I would strongly suggest that you make the trip to the Bluff City one time. As a veteran volunteer for this event, it consistently gives me the opportunity to see some of the best amateur bands in the country. These are the bands that day in and day out are keeping this music we all love so much alive. 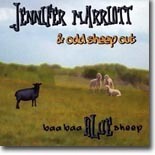 Some of the buzz surrounding this past IBC centered on the amazing voice of Jennifer Marriott, and I was glad to see that she and her band, Odd Sheep Out, were assigned to my home in Memphis, the Rum Boogie. I came away from Memphis with a copy of her latest record, Baa Baa Blue Sheep, and it�s high time I got around to reviewing it. The first cut, "Chicago Blues,� finds our lead singer out in the cold. Her lover left her behind in Chicago all alone and she�s finding out the real meaning of blues in Chicago. �Loving you was a gamble�don�t know if I win or lose�if you want�make it happen�play me some of those Chicago Blues!� It turns out she�s not too heartbroken, �no need to worry�it�ll be all right�cause you left me in Chicago on a Saturday night!� I have no doubt that Jennifer will end up just fine. This theme of mistreatment continues on the next cut, �I Don�t Understand.� Jennifer�s a hard working woman and somehow her man is still finding time to step out on her. �I work hard at night�come home in the morning time�found some strange clothes in my closet�they weren�t mine.� �I�m a good lovin woman�just want to please my man�why he�s acting so funny�I just don�t understand.� I don�t understand it either but he obviously needs to go. Good luck! Peter Marriott�s blazing guitar intro leads into his vocal on the next tune, �Pleasure.� �Come sit down beside me�why don�t you tell me your name?...cause I�ve been watching you for so long�and its driving me insane.� Peter obviously has a major interest in this object of his affection. And, of course, Jennifer has an answer for him. �Hello sweet daddy�Pleasure is my name�every time you flash those sweet eyes at me�you really�really fan my flame.� This is definitely one hot connection where the sparks are going to fly. Probably my favorite song on this record is �Outrunnin� the Rain.� Jennifer�s vocal on this song is just amazing and her words stay with you, �I�ve been good�I�ve been bad�yes I have�nothing ever really changes�.wherever I go�I�m outrunning the rain!? Odd Sheep Out is a very tight band and I hope I get the opportunity to see them again soon. �Invested in You� brings us back to the reality of trying to make relationships work. Sometimes we all make bad choices and the thought of trying to mold a person into that image we hope for doesn�t always work out. �You lost the cards�you pawned the ring�you lost just about everything�wrote hot checks�all over town�I�m invested in you, baby�why do you want to treat me this way?� Mike Peace�s harp work provides the intro to our next cut, �Sweetness and Delight.� �Said good morning�are you feeling all right? He had a gleam in his eye and smiled so bright. Said 'awe baby�don�t look at me that way'�when you do�all I can say is �Sweetness and Delight�you�re my Sweetness and Delight!� Sounds like this is one relationship that is going to make it. �Mister�can you spare a little change� is Jennifer�s inquiry on our next tune, �Spare Change.� �Change is in your pocket and its spinning on a dime�mister, can you spare a little change?� Soulful guitar work by Peter Marriott underscores her need for a just a little help from this stranger that she�s encountered. Temptation and bad choices influence the lyrics in �Long, Slow Spiral Down.� �Take that first little step�in a stroke of violence�God knows what else�give up without a sound�Please stop�or you start the long, slow spiral down!� The price of being a victim is a heavy one and there are choices everyone can make in the moment that will keep them safe. For years I�d go to San Diego and ask my friends there who were the blues players in town that I needed to hear. Two names came up all the time; Len Rainey, who I�ve yet to hear, and Tomcat Courtney. I finally caught up with Tomcat at the 3rd floor bar of the Redfish in the Gaslamp district, bought a couple of his self-produced CDs from him at the show, and I�ve been a fan of his ever since. So I was glad to see that Tomcat finally got the chance to put out a national recording, and thanks to the good folks at Blue Witch Records, we�ve been blessed with Tomcat�s new record, Downsville Blues. Tomcat starts out with �Cook My Breakfast,� and he wants it delivered in bed. Soulful notes emanate from Bob Corritore�s harmonica as Tomcat proceeds to lay down the facts, �Cook my breakfast�bring it on girl to my bed�when I eat this morning�you know your sweet daddy been fed.� The morning has to start with breakfast and Tomcat definitely knows how he likes it served. We move on to hear Tomcat tell us about his girl�s ride, �Four Wheel Drive.� �I can�t catch up with my baby�.since that girl got that four wheel drive�I tried to flag her�but she just won�t let me ride!� Sounds like this relationship isn�t as tight as Tomcat thinks it is and his girl definitely has a mind of her own. Intricate fretwork by Chris James leads us into the next tune, �Wolf That Howls.� �I�m the old wolf�everyone�s wondering�where I prowl�they don�t see me all day long�but every night they hear me when I howl!� True to his nickname, Tomcat still gets out and howls at night�still going strong at 79 years young. We should all be so lucky. �Shake It Up Baby� finds Tomcat still in the mood. �I say shake it to the left�shake it to the right�shake it up mama 'til you get it right�we�re going to shake it up, Mama�cause we�re going to have a ball tonight!� I�m not convinced Mama can hang with the Tomcat but I�m she he wants her to try. Slide guitar licks serve notice on our next cut, �Crying Won�t Help You,� that sometimes there�s just nothing that can be done to fix a broken situation. �Cryin won�t help you now, baby�cause you�ve been so mean to me�the way you�ve been treating me�you just reap what you sow!� This theme of mistreatment continues in �Bottle It Up and Go.� Sometimes it�s just better if things end and you move it on. �You and I sneak to the river�I grabbed an alligator and rode him like a hoss�bottle up and go. Man these high powered women, they got to bottle up and go!� Tomcat closes Downsville Blues with �Railroad Avenue.� Here again, a woman is causing ole Tomcat some pain. �They had a party the other night�they were drinking wine and smoking crack�when she get with her so called friends�you know it�s a shame�.the way she acts.� This woman is just not going to meet up the standards of what Tomcat needs in his woman and its time to let her go. 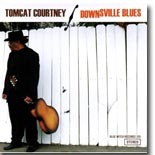 Downsville Blues definitely captures the essence of the Tomcat Courtney I know. He�s still this old Texas gentleman, holding court in a room full of friends and taking great delight in sharing his 79 years of wisdom as only he can. Those in the know have been aware of Tomcat Courtney for a while now, the rest of us are lucky to get this rare glimpse into the soul of one of San Diego�s greatest blues treasures. An excellent supporting cast of Chris James, Bob Corritore, Patrick Rynn, Brian Fahey and Willie �Big Eyes� Smith gives Tomcat the opportunity to do what he does best, which is to regale us with songs that share Tomcat�s world through his eyes. This wonderful record can be found at www.bluewitchrecords.com. You�ll be glad you�ve added it to your blues collection.